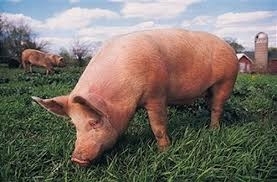 Finally, the government has decided to eliminate pork — from the menu in federal prisons... The Bureau of Prisons, which is responsible for running 122 federal penitentiaries and feeding their inmates three meals a day, said the decision was based on a survey of prisoners' food preferences: They just don't like the taste of pork. A woman whose son is in federal prison in Fort Worth says he has complained about the lack of pork, saying he had heard it was because of complaints from Muslim inmates. Do federal inmates not like pork? Or are they just saving their bacon?